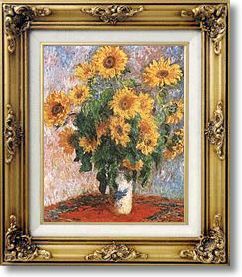 Bouquet de Tournesols (Sunflowers) by Claude Monet - no-risk guarantee! Order now with your no-risk guarantee and free delivery worldwide, via our secure credit card facilities that can charge your credit or debit card in pounds (£), US$ or euros. The US$ prices next to the pound prices below are provided as a guide and depend on current exchange rates.